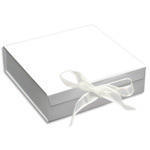 Beautiful keepsake gift boxes with magnetic closures and ribbon fastening. These beautiful gift boxes can be used for multiple storage purposes when the gift is removed. Cake Stand Keepsake Gift Boxes: Suitable for our classic single, two and three tiered cake stands with a base plate of no larger than 28cm. Make your choice from the drop down menu on the item page where applicable. Teacup Trio Keepsake Gift Boxes: available in Silver, Plain Pink, Gold, Patterned Pink, Pale Yellow and Patterned Damson. Please note: Trio Gift Boxes will only accommodate ONE teacup, saucer and tea plate trio. Tea Set Keepsake Gift Boxes: suitable for for 21 piece tea sets consisiting of 6 x teacups, saucers, tea plates, a milk jug & sugar bowl, cake plate. These boxes will not accomodate more than the items listed above nor tea sets with tiered cake stands. 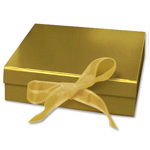 You may also purchase gift boxes to fill with your own gifts. As we try to match the colourway of your chosen teacup trio the ribbon colour may vary. Please note: We cannot refund the cost of Gift Boxes.